These words have been attributed to Michelangelo and they came to mind when I contemplated this photograph I snapped back in March. It is an image of my grandmother Carrie only a few weeks before her 101st birthday. Her hands had never held an iPod. 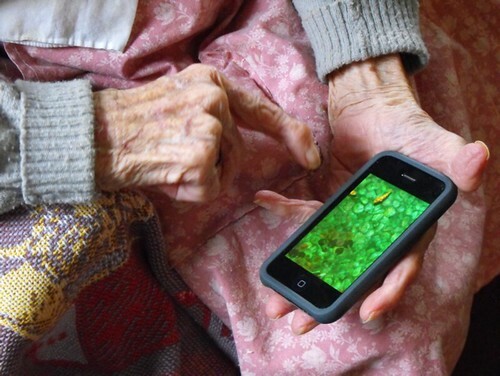 On a whim I placed it in her hands and brought up the Koi Pond app. Suddenly she held an experience that she could hardly fathom. I realized quickly that this thing I carry in my pocket each day was a thing of wonder. Seeing my grandmother’s 101 year old eyes light up as her fingers splashed the touch screen pond was a delicious moment. My grandmother spends her days quietly in her chair by the window reading the books and magazines people bring her. Now here she was moving this digitized water and the fish were responding to her touch. When I remember this moment a flood of ideas come to mind: how we take our little gadgets for granted, how the generations can find new territories for connection, and how the world quickly shifts for some but not all. Only a few days ago I put this picture into a slidedeck for a presentation I’ll be doing soon. ALA conference attendees who will be participating in the “Punch it up with Pictures” preconference will hear me talk about how a picture can open up a world of stories. As you can guess, this will be an image I’ll be using for sometime to illustrate that point.